Heel cushions are a great accommodation for shock absorption; they are generally used in thicknesses of 1.5mm, 3mm and at times, even as much as 6mm. 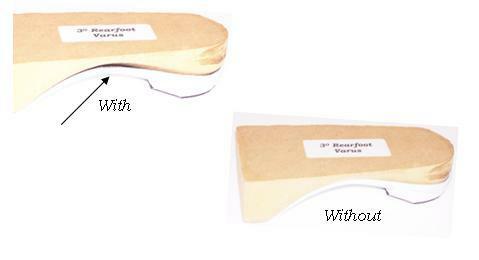 Did you know that heel pads tend to lift the heel out of the orthotic shell and reduces arch contact/pressure? By reducing the arch pressure, the heel pressure can actually increase. Therefore, if the goal is to unload the heel, cushioning may not be the best option. Want to see more information like this? See more bioTips. For more information, please contact us (902) 883-7521.